So much of our creativity as communicators is about problem-solving – whether you’re selling a product or communicating an idea. We can be better problem-solvers if we’re really clear in communicating what the problem is exactly. 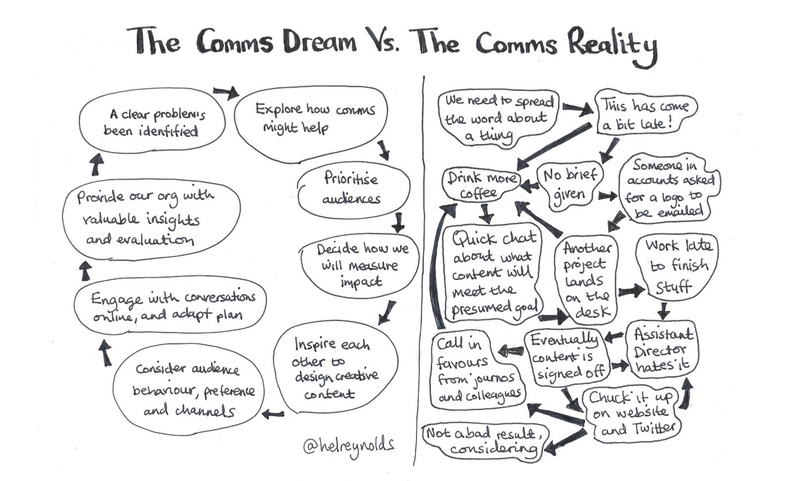 For example, I did this diagram to show the problem of an ever-increasing workload experienced by many comms people. Paul Brook from the Joseph Rowntree Foundation shared a blog post where he has taken on the complex and often misunderstood subject of poverty in the UK. And he’s done it with drawings. This sketch shows how people can become squeezed and locked into poverty. (Thanks to Paul for letting me share it here). As he says: “Deeply held beliefs and diverse cultural and political narratives mean that messages about poverty can get lost in translation. Many of us working in comms know that we need to communicate in different ways to ensure our audiences truly understand what we’re saying. So let’s have a go at drawing a problem. A pencil, a rubber, a pen and some blank paper. 🤨 What challenges does your organisation face? 🤔 What problems do your audiences have? 🧐 Have you yourself got some issues that cause you difficulties? Pick a problem that you think you can explain. Maybe your workforce don’t communicate effectively between teams. Or they are demotivated for some reason. Or, similar to the Joseph Rowntree Foundation example, it might be a problem faced by your audiences . 🤨 What are the factors that contribute to this problem? In pencil, try to sketch the problem. 🤔 Do any mental pictures pop into your head? 🧐 Do any analogies come to mind? Or just do a mindmap, where you show your problem in a circle the middle with your thoughts on the outside. If you get really stuck, just draw a picture of a cat telling people the problem in a speech bubble. Everybody likes cat pics. When you’ve described the problem and you’re ready, go over it in pen. Erase out your pencil marks and if you like, add a splash or colour. Publish it for other people to find. Take a picture on your phone (or scan it if you’re fancy) and post it to your social network of choice. Have a look for other people’s posts and get a chat going with other creative comms people.